Late last week we picked our red currants… it was a disappointing harvest. A large percentage of the berries failed to form. 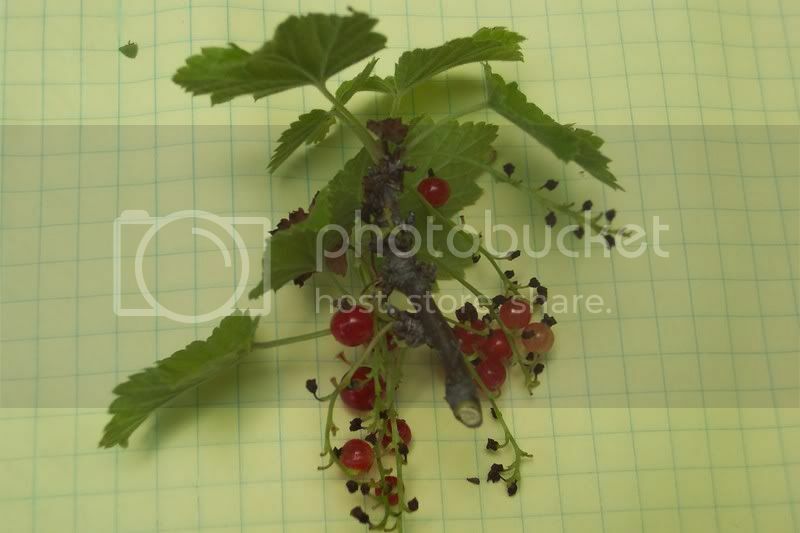 The photo clearly shows small, dried spheres where the berries were supposed to be. Something must have happened around the time the bushes were flowering causing a disruption in fruit set. We did have a very warm spell that initiated early flowering. That was followed by a cold snap, which may have killed some of the flower buds. All of this is just a guess on my part. The final count?…about 1/4 of our usual yield. This season’s warm temperatures have caused our tomato plants to grow like “crazy”. We have relatively high fertility in our garden beds and the tomatoes are regularly watered, hence all the growth. All of these factors are setting us up for the potential of Blossom End Rot in our tomatoes. The rapid growth causes the plants to have difficulty in taking up calcium from the soil. 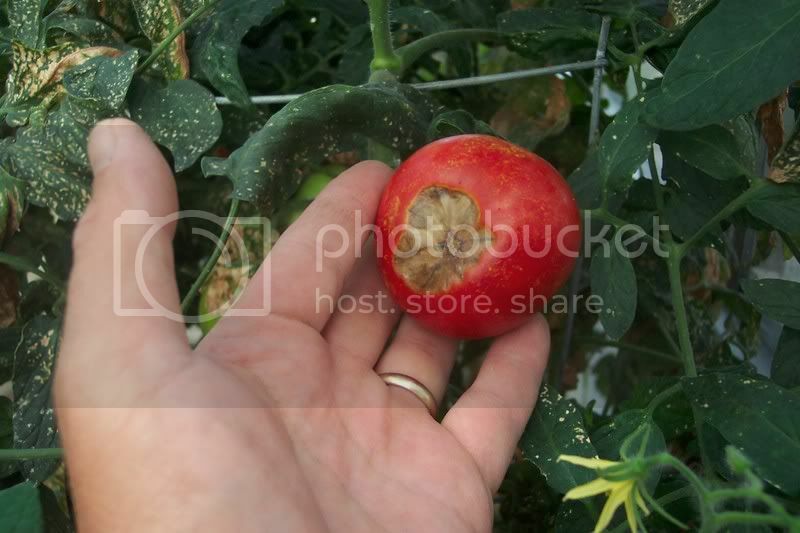 The lack of calcium in the plant during the time the tomato’s fruits are growing will cause Blossom End Rot. It’s pretty disappointing to have grown all those beautiful plants with all those tomatoes on them and then have them start to rot right on the vine. 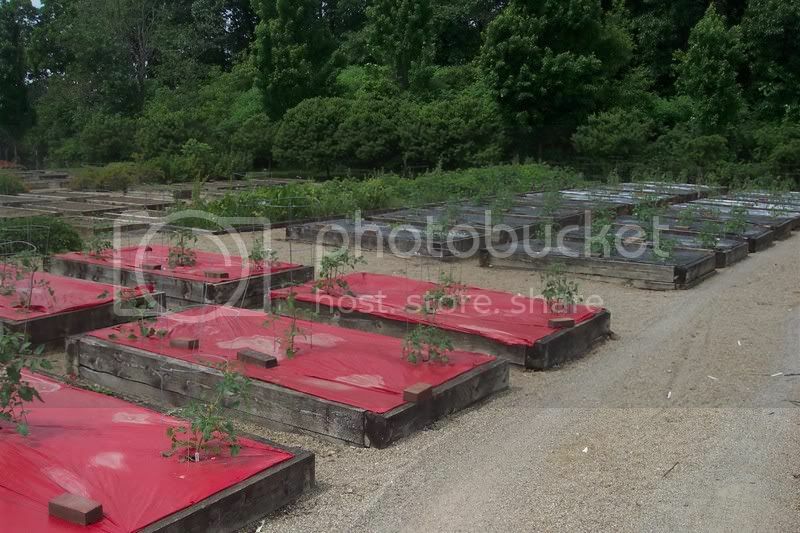 Sometimes even an experienced tomato farmer can lose nearly all of his crop to this problem. What we are doing right now, is spraying a soluble form of calcium right on the leaves to ensure the plants get some supplemental calcium. You can find these sprays in most any garden center. We have been spraying about once or twice a week. Keep in mind that foliar sprays will not help Blossom End Rot once it starts. One crop that is new to our herb garden this year is Valerian. Many of you probably have seen Valerian in capsule form in the vitamin and health supplement department. Valerian is widely used as a very effective natural sleep aid. I use it myself on occasion, especially if I have had too much coffee to drink late in the day. We decided to cut down these plants before they formed seed. 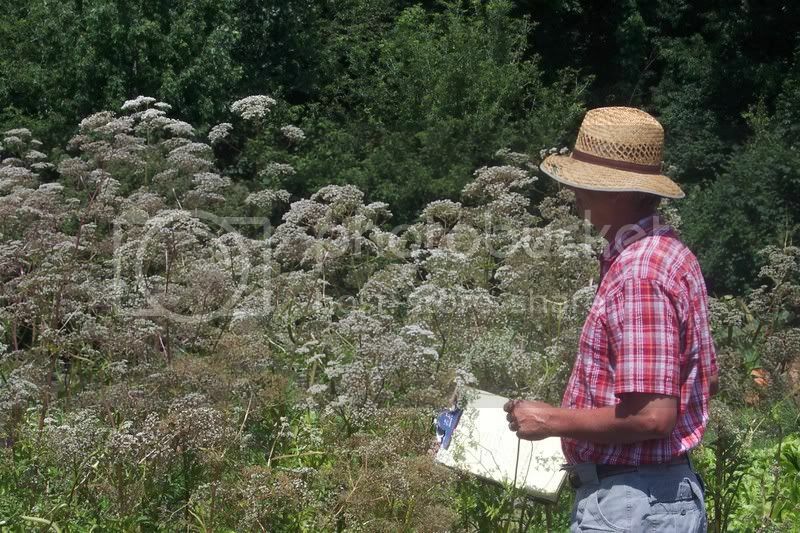 We were concerned that with all of that seed producing potential, we could easily end up with a Valerian weed problem. There was a lot of plant material as you can well imagine. Unfortunately, only the roots are used for their herbal value. So the 6′ tops went into the compost. Those flowers by the way, have been out for weeks. They gave off an unusual fragrance, smelling sweet and bitter at the same time. The jury seems to be out on the optimum time for harvesting the roots. Farmers in Europe have one theory, while farmers in other parts of the world have theirs. I think I’ll just harvest them when I get some time later this fall. In the meanwhile, their tops should grow back and put more energy into root production rather than seed production. Last year we planted a new (for us) perennial; Geum “Blazing Sunset”, with seed purchased from Thompson and Morgan. 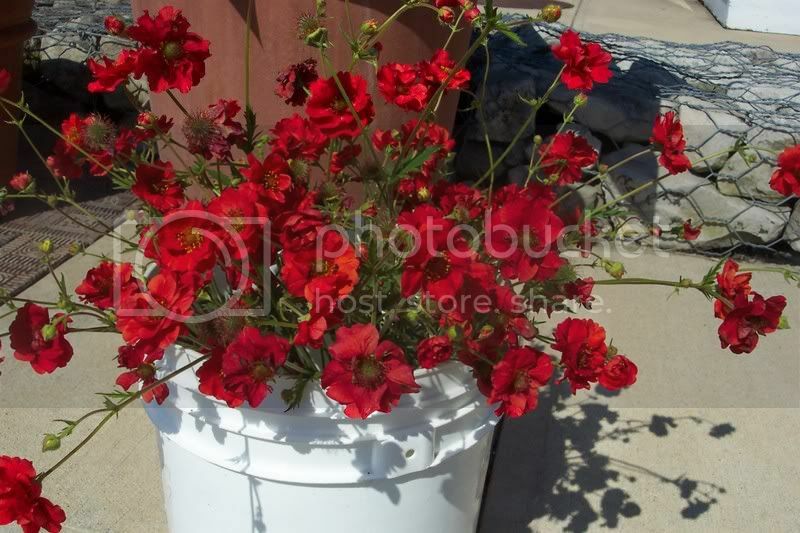 Geum is a relatively easy plant to grow if you follow the instructions on the seed packet. Ours are quite happy planted in a dry garden that gets some irrigation and full sun. The plant bears interesting flowers on rather spindly stalks. When planted in a mass, as are ours, the effect is pretty striking with red flowers almost floating in an airy space. When cut, these flowers make an arrangement that is a real conversation starter. They seem to hold up very well in a vase too. The Geum I cut last week are still going strong. As I mentioned in earlier postings, all of our late spring flowers are fading fast due to the above normal temperatures, our Geum are no exception. Fortunately, we were able to share them with others before they fade. I hope you enjoyed the photo as well. 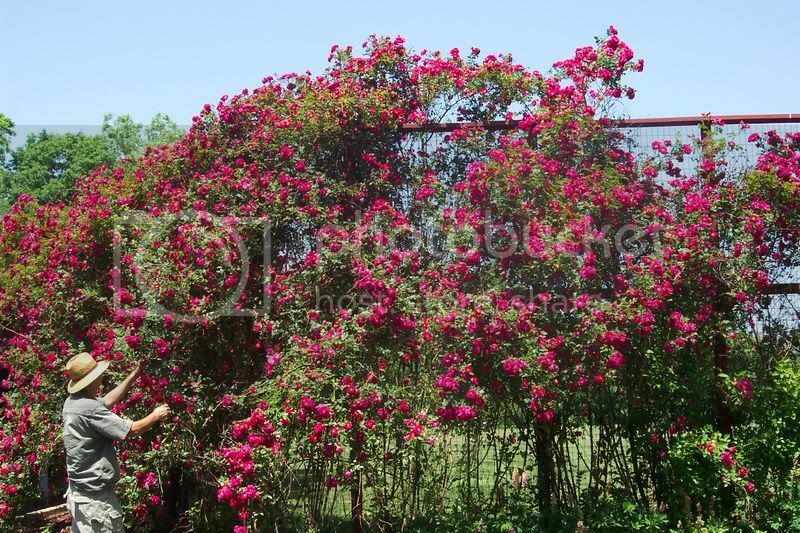 Actually, it’s Henry, Henry Kelsey Climbing Roses. 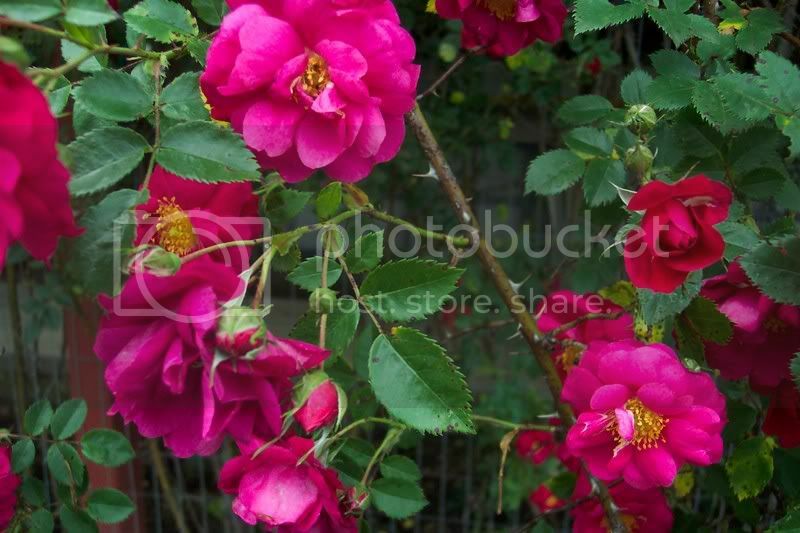 These roses are part of the “Explorer Series” of climbing roses developed in Canada, I think. Apparently, Henry Kelsey was a famous individual who explored Canada, I don’t know the whole story. The flowers are semi-double, deep red with yellow centers. They have a little fragrance, but not much. They are described as “continuous bloomers” in some catalogs. Ours, however, after this first flush of blossoms, re-blooms very little…just a blossom here and there. They also are resistant to powdery mildew and seem to be able to handle light infections of black spot (a fungus that infects rose leaves). I hardly ever spray these roses for fungus… once, maybe twice a season. The catalogs describe them as growing to 6′ wide and 10′ feet high. The width sounds about right, but I measured ours and they were over 14′ tall and drooping at the top. I used to wrap these roses for winter protection, but since they have gotten so large, I just let the fend for themselves for the winter. Henry Kelseys are plenty hardy, they can be planted as far north as zone 4. This variety of rose doesn’t like a lot of pruning, so I tend to just let it go. I plan on doing a little pruning later on this fall or spring to stimulate some new growth which will help fill in the lower portion of the arbor. We always de-head the roses after flowering, let me tell you that is a BIG job! We have to snip off each flower before it starts to form “hips” (small berry-like fruit). That is no easy task with the canes 14′ high and 50′ + feet of arbor! (the thorns are pretty picky too) Some folks will leave the hips on for the birds to eat. A lot of energy is expended by the plant in making all those hips, energy that may be used to produce more canes and flowers for next time. This excessive heat we have been having will hurry the blossoming along, it won’t be long until the roses are gone until next year. 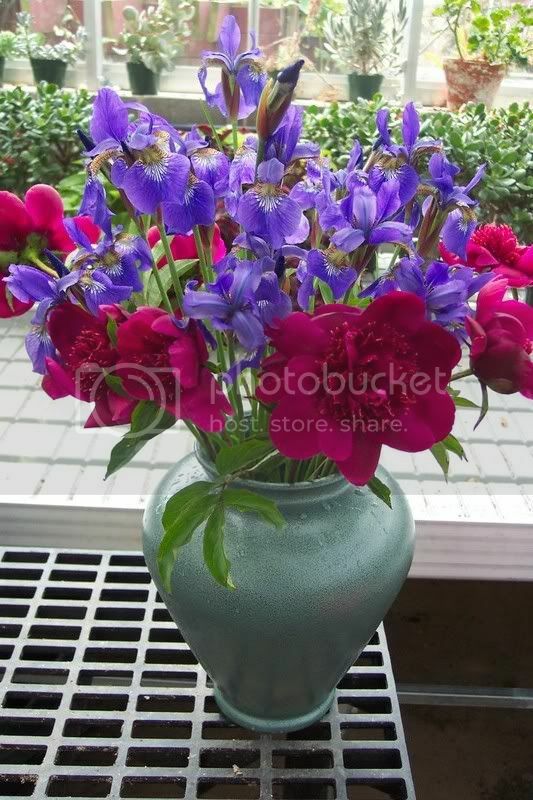 I’m no flower arranger, but don’t these Peonies and Siberian Iris look great together? Hey, they’re flowers! What’s not to like? These were cut last week, the excessive heat we have had, has accelerated the flowering of both of these flowers in our garden. As a result there are not many are left to enjoy. This past Sunday, many of the blogsmonroe bloggers and members of their families got together at the home of Monroe News editor Dan Shaw (our fearless blogging leader!) and his wife Kathy. When Judy and I first met Dan several months ago to discuss this gardening blog, he mentioned that he and his wife were avid gardeners. Well, let me tell you that was an understatement! They have transformed an ordinary yard into a series of wonderful outdoor spaces complete with front entry gardens, flowers gardens, a vegetable garden, and even some fruits and berries. Potted plants and containers accent their deck. Every flower, tree, shrub or vegetable was chosen and planted by Dan and Kathy. Many of the plants were from past homes they had lived in. Kathy told me that each time they moved, they would dig up some of their favorite plants and moved them with the rest of the family! That eventually added up to quite an interesting collection of plants. Regular readers of this blog know that I like to use photos in my posts, in this case I have none to show you, unfortunately. I didn’t bring my camera to the picnic for cryin’ out loud! Fortunately, Jim Dombrowski, who writes the blog Revolving World, did bring his camera and let me borrow it for some snapshots. Hopefully we can get a couple of those photos posted. It was a very enjoyable afternoon and I know, judging by my fellow bloggers postings, that they had a great time too. I have no statistics on this, but I believe that tomatoes are grown in more gardens than any other vegetable. As a result, a lot of tomato tricks and technology have been developed over the years. The red colored plastic has been researched by Agricultural Universities. It has been proven scientifically that the red light that is reflected by the plastic stimulates the tomato plants to produce more tomatoes. We really don’t run any kind of formal experiments here and just by “eyeballing” our harvest, we haven’t noticed any appreciable difference in yield from year to year with the plastics. However, if one were to measure the increase over many acres, I’m sure the difference would become apparent. The silver plastic film has also been extensively researched. It works by reflecting light upward and confusing insects. The bugs become disoriented and can’t find your tomatoes. The brown colored mulch, as far as I can tell, works only by smothering weeds. Actually, all three of these mulches have the ability to suppress weeds. In our tomato beds, we do very little in the way of weeding. I’m sure you noticed in the photo that we use tomato cages along with our plastic bed covering. This technology has been used for tomatoes in one form or another for decades. The cages are useful in helping keep the plants up off of the ground. This makes for fewer disease problems and easier picking. We started out years ago putting six tomato plants per bed. By using the cages, they all fit. The problem was that the plants always grew so large that they crowded each other. As a result, diseases and other pests seemed to spread quickly. It was hard to pick tomatoes when they were that close together too. There is an old British gardener’s saying that goes something like, “Air and light makes tomatoes right”. So, this year, we finally decided to heed that saying and separate our tomato plants to give them more space. Only three plants per bed were planted this year. I have a feeling our harvest will be nearly as large with only half the plants being used. The quality should improve as well. Tomato technology and tradition marches on! 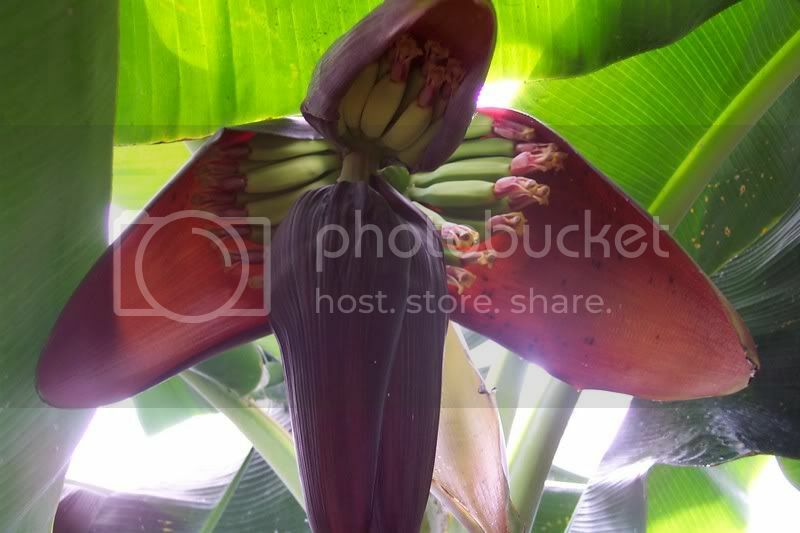 Nah, it’s just a view of a banana flower. I thought it might be fun to show how they look. I always get a “big kick” out of these flowers. I hope you enjoy this photo. 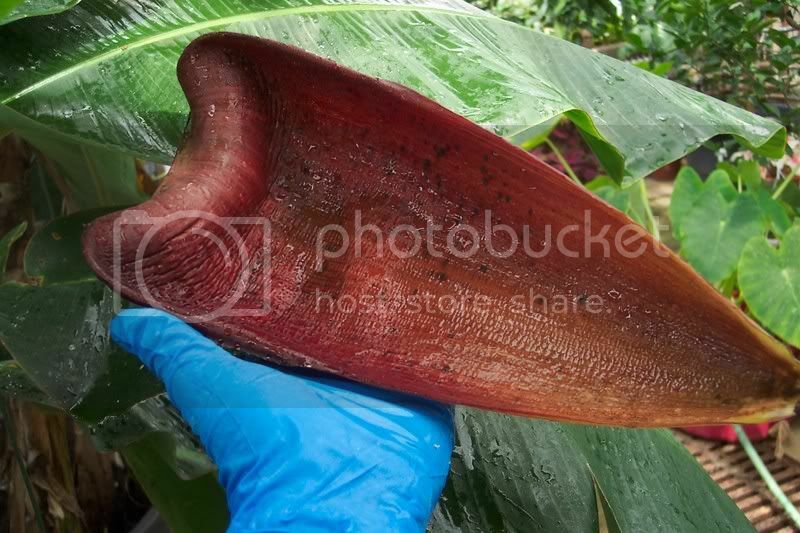 Posted on June 7, 2007 Author rdluzenCategories UncategorizedLeave a comment on Man-eating Plant ? Here is another reason I don’t particularly like dumping chemicals on a lawn just to kill those “evil” dandelions. Chemicals have their place, but they are often used indiscriminately. This was the second time in two years that these grapevines were damaged by the same compound. The first time it was a granular “weed and feed” that was applied. The results were much the same. 2,4-d kills weeds by disrupting the hormone balance within a plant. It is this disruption that causes the severe twisting and curling you see in the photo. 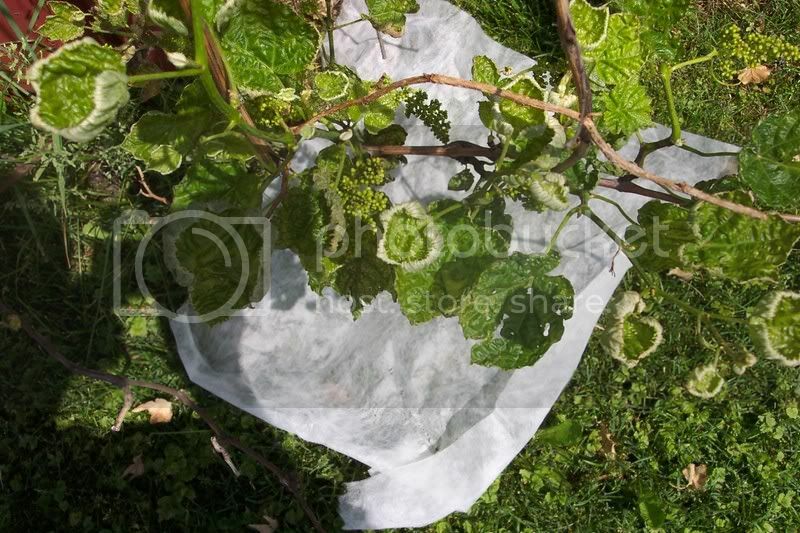 Unfortunately, the chemical will kill any broadleaf plant, this includes grapes (which are particularly sensitive). Other plants nearby were also affected including some spinach. With a mild exposure, most plants will out grow the damage. However, it has been around 3 weeks since the grapes were exposed and they haven’t really “bounced back yet”. I’m afraid that some of these vines may have gotten a higher dose than they are able to handle. The fact that they have been damaged twice in the past three seasons, I’m sure has some bearing on their slow recovery. Posted on June 5, 2007 Author rdluzenCategories UncategorizedLeave a comment on What’s Wrong With This Picture?